When you set up your revocable living trust, you must name a successor trustee - someone to step in and administer and settle your trust for you after your death. He would also be called upon to serve should you become mentally incapacitated. Most trustmakers act as trustees of their revocable trusts, unlike with an irrevocable trust where someone else must be appointed. A successor trustee waits in the wings to take over when you can no longer manage the trust yourself. Your successor trustee is responsible for settling your trust or continuing to manage it for you after your death - exactly which would depend on the terms you set for your trust in its formation documents, called a trust agreement. If you directed in your trust agreement that all assets and property held in the trust should be transferred to beneficiaries when you die and that the trust should then be closed, your successor trustee is obligated to follow this directive. In some cases, however, you might want your trust to remain up and running, such as if it's holding a property for the benefit of your minor children. Minors can't legally own property, so your trust would continue to hold it for them until they reach an age you specify. 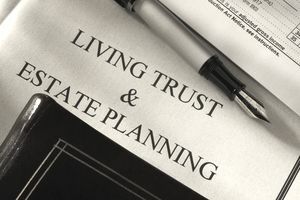 Revocable living trusts avoid probate, but you might have created a pour-over will to move assets not in the trust into your trust at the time of your death. This process would require probate. Serving as a successor trustee is a huge responsibility, and it's often a time-consuming burden. You should be able to choose the right person or institution for the job with the help of your estate planning attorney, but it's important to name one or more "backup" trustees as well in case your first choice isn't available to serve. Don't name someone without speaking with him first so you can be sure he's willing to accept the job.